During the cold months, it is possible to slow down to something resembling a sane pace. During the warm months, I try to get the most out of the long days. Fishing trips morph into fourteen or more hour monsters that leave me exhausted and wondering why I put myself through the torture. The continuing drive to get as much time in on the water as possible tends to place fishermen out in good weather and bad. In winter, even the diehards tend to slow down at least some however. A particular trip this past summer found me drifting slowly down the Caney Fork with David Perry. The cicadas were on but things had been a little slow. The sun finally began to take a toll somewhere around three miles downriver from the ramp where we started. Fishing hats are great for blocking glare and peripheral light but also excellent at trapping heat. Both of us were approaching that point where you realize you are too hot and probably more than a little dehydrated. Before things got too crazy, we finally had the sense to anchor up along a shady bank where the effects of the sun would be minimalized. The smart thing would probably have been to stay home. The air temperature was in the mid 90s but thankfully was moderated by the cool water flowing under the boat. If you translate this memory into winter weather, it would sound something like this: After three weeks of piercing cold, I decided that I had to get out on the water. The Smokies streams were so cold that ice lined the edges and in a few places, a little anchor ice was even showing up. Just getting to the water meant taking my life in my own hands. I spent the whole day drowning nymphs in water that was running 32 degrees and it was clearly pointless to be fishing. Things got really bad when a buddy stopped by and I couldn't even talk normally. Thankfully he had his heater going and somehow translated my babbling into "I'm freezing my @$$ off" and insisted I warm up in his truck. After a half hour with the heater going full blast, I was finally able to at least drive myself back home. The second story is clearly a work of fiction. Even the relatively crazy fishermen (I fall somewhere between the two extremes although closer to the crazy category) will normally wait until a break in the weather with afternoon temperatures rising above freezing. Even when you do make it out on the water, the pace can be slow with the focus more on keeping warm. Any fish that are caught are seen as a blessing. Then again, if you go home fishless, there's always the slight feeling that you should have been doing something differently out on the stream. Afterall, the fish still have to eat. Cold weather entertainment does not have to even focus on fishing. 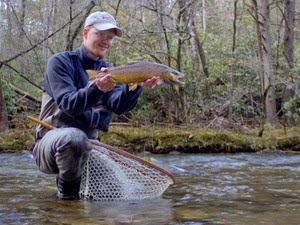 Sometimes a great picture shot on the stream can make the day instead of a nice fish to hand. Of course, there are trips during the transitional months that can turn into problems as well. One March, a few years back, I was hustling up the Little River Trail above Elkmont to a remote stretch of stream. The forecast highs in the mid 50s never happened, at least not anywhere near the water I was fishing. That was probably because the water temperature was at best in the low 40s still and the stream had a strong flow even for spring. Around the time I would normally be thinking of lunch, I was thinking more along the lines of "I really have to find a way to get warm." Knots had become impossible to tie which is my usual indicator of getting too cold. Thankfully my thumb could just barely operate a lighter. Scraping together a couple dry leaves and a small pile of sticks, I soon had a tendril of smoke as the flame caught. The next thirty minutes found me fighting for just a little heat. Foraging for dry wood turned up a pitifully small collection. After pulling out most of my fire building tricks, the flames produced enough warmth to return feeling to my fingers although the pain made me wonder if freezing was maybe the better alternative. I should have known better, should have been better prepared, or should have just waited another week. Yet, I caught a good number of fish and what really stands out about that day is that I had the whole stream to myself. The major hatches were on at lower elevations but not up high yet. Having the whole stream to yourself may not sound like much, but it allows you to slow down and enjoy time with the camera or building a lunch fire instead of worrying that someone may be jumping in ahead of you. The camera provided the best entertainment that day. While there have been some crazy trips in the cold, such as the time we slid the drift boat down 60 feet of ramp on the ice just because we really wanted to fish that day. 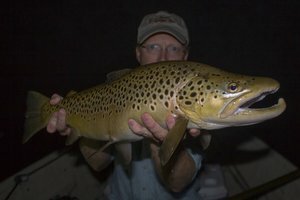 The bottom of the boat was slightly worse for the wear but we did boat a couple of very nice browns on streamers. I also can't forget the day on the Caney when the air temperature never got over 20 degrees but the trout were rising to stillborn midges all afternoon under a slightly overcast sky. 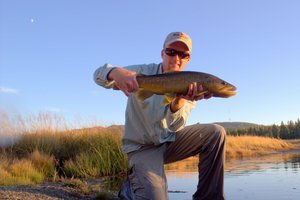 The average trout was around 15 inches but several much larger fish threw the hook or broke me off before I could get a really good look at them. Most winters, I find myself fishing a few times per month just for the principle of the thing but usually not very hard. The days are more relaxed, and I'm just as likely to watch a nice sunset as I am to keep fishing hard up until dark. My entertainment on days like this often revolves around a camera. My favorite subjects often have water involved but not always fishing. A recent hike resulted in this picture among several others. The light was bad, and I didn't get very creative with my shot angles, but sometimes just getting outside is better than nothing. As winter slowly gives way to spring, my entertainment will run the entire gamut from photography in the coldest months with occasional fishing trips, to more tying as the spring fishing season approaches interspersed with fishing as cabin fever grows worse. Finally, the fishing trips overtake everything else. During many fishing excursions, I find myself forgetting to even bother with the camera. At the end of such a trip, I find myself wishing for a slower pace and recalling my winter entertainment and relaxation with longing. Of course, on the very next fishing trip I'm going full speed again. Human nature being what it is, I tend to forget the enjoyment that comes from slowing down and allowing the stream to slide by while the fish happily feed unmolested. You show me a fisherman, and I'll show you an optimistic person. Really what keeps us going is the belief deep inside that the next fish will be a monster or that on the next trip you will land more fish than ever before. Honestly, I think that fishermen would probably make the best gamblers. I don't know why casinos across the country are not using advertising specifically targetted to fishermen. Of course if we switch to another type of entertainment we will probably quit fishing which would be a disaster. Winter simply reminds me that I should not just be optimistic about the fishing possibilities. If I stop to look around me while I'm fishing, I suddenly see an Otter swimming down the far bank while a Pileated Woodpecker alternates flying from branch to branch and shouting its raucous call, reminding me that it would be nice to carry more than one lens when I'm out in nature. Now if I can just remember to look for these things in the warm weather, my winter entertainment might transition to year-round entertainment. Really nice written and I love the photo! It's almost as you're describing a part of my life. 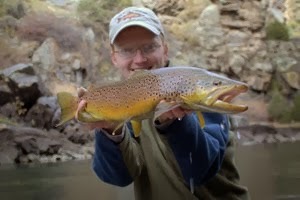 I think that passionate fly fishermen are very similar. 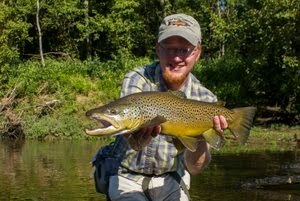 Living in Sweden I have to be content with armchair fishing, tying flies and other winter occupations. You need to get you one of those gizmo's that have one side that scratches sparks and magnesium on the other side. I hear that can start a glass of water on fire. Well, almost. I actually think I have one of those but haven't used it much. Thanks for reminding me...I'll have to get it out and try. M.O., I've lived where I had to armchair fish as well. It always makes you appreciate a warmer climate where you can at least occasionally get out in winter. "You show me a fisherman, and I'll show you an optimistic person. Really what keeps us going is the belief deep inside that the next fish will be a monster or that on the next trip you will land more fish than ever before. " All in all a very enjoyable read!